The start of my summer in Washington, DC! Hi Everyone! My name is Emily Gydesen. I recently completed my third year in the dual degree BS/MBA program at The College of Saint Rose. I am really excited about my summer ahead. Not only is it the summer before my final year of school, but I have been selected for an eight-week internship opportunity at the Offices of the Legal Services Corporation in Washington, DC! The Legal Services Corporation is the largest single funder of civil legal aid programs for poor people in the United States. LSC was established by an act of Congress in 1974. LSC’s Board of Directors is appointed by the President of the United States and confirmed by the Senate. For more information visit the LSC website. This summer, I will be working for the President of the Legal Services Corporation, James Sandman. The Sandman family has a strong connection to The College of Saint Rose. Jim is the son of Edgar Sandman and the late Margaret Dugan Sandman `40, both former trustees of Saint Rose. My internship this summer is the PROJECT 70 internship. PROJECT 70 is a scholarship/internship gift initiative started by the Class of 1970 in honor of their 35th Reunion. Nancy Sandman, Jim’s sister, is a member of the Class of 1970. Initially, the internship was open to a Saint Rose student of any major. Some of the duties required of the intern include preparing correspondence for the President and his staff, conducting research for submissions to Congress and assisting in preparing for meetings of the Board of Directors. Jim has informed me that he is going to work the internship around my business major and marketing concentration. Needless to say, I am excited/nervous about everything I will be doing over the next two months! My internship officially starts at 8:30 am today, Monday June 4th! 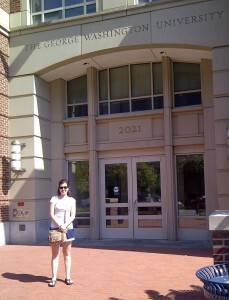 Yesterday, I was able to move into my dorm at George Washington University. Luckily, I was able to get a single on campus because it is only a short distance from work! At the end of this post is a picture of me standing in front on my dorm building! Thanks to my sister, Lydia, for being my photographer. During my time in DC, I will use this blog to update everyone on my internship experience and my travels in the city! While I have never blogged before, I am excited to use this as a way of staying connected to family and friends both at home and at school. I will be posting multiple times throughout the week. Please feel free to comment here on any of my posts throughout the summer and I will do my best to reply!